A good friend let me know about this dollhouse kit being offered by a company called Altaya Publishing. 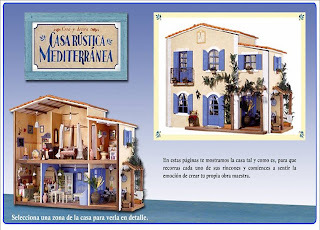 The site is in Spanish and from what I can read, it appears to be a hobby catalogue program where you get instructions and parts of this dollhouse (including furniture and lights) intermittently through the mail. A visit to the Altaya site will take you on a complete tour of the finished dollhouse, as well as detail what you can expect once you sign up to receive the collection. I really like the beamed ceilings, balcony and porch of this structure. I'm not happy about the lack of stairs---why do dollhouse makers do that? I guess to save space. Disappointing regardless. I would only keep a few select pieces of furniture that come with this dollhouse. I wish I could buy the pre-decorated, pre-built shell. I would love to redesign the interior to reflect a more modern country aesthetic. Again, those beamed ceilings are drool worthy. Anyone out there know more about this kit or the reputation of Altaya Publishing?? Altaya is pubished in Spain , Portugal, France and Italy, and as far as I know this house is available in all the countries, except in Italy. I made a house from Altaya some years ago, a mountain rustic house and the quality is quite good. Yuo can se it in my blog, at the end of the page, or in my site, at press, since it was published in the UK magazine Doll house world. I am now colleting casa mediterranea, but here in Portugal has another name, Casa de Praia, which means The Beach house. the colection includes 100 issues with instructions for building , but also how to do lots of other things to put in the house, mainly with Fimo, and one or more item for the house. In a country like Portugal where there are 1 or 2dollhouse shops, this is a nice way to get one just at your door. Unfortunately, Altaya last edition, A big doll house, call the Palace of the Doll,has been a terrible experience for those who collect it, in France, Spain, and Portugal, leading to a lot of complains, envolving Associations for the Consumer Protection. Thanks Ana for all of that great information! I will check out your site. Yes, it´s a similar thing just as del Prado. By the way, I am also a lover of modern dollhouses. Actually, I'm making furniture from scratch, all designed by myself, in a contemporany style. All th joints are made as the real one and no glue is necessary to put all the elements together. The bed as inlaid flowers made with other types of wood. I am having trouble finding your creations on your blog. Hi! only today I saw your omment.. I know I am very late to comment here, but it's because I just found this topic using a search engine. In Greece they started selling the Mediterranean House exactly 10 weeks ago, so later than in Spain. I was surprised by the quality of the construction, but some furniture pieces could be better. I am planning to paint some of them over. And I am planning to get the whole house. The lack of stairs annoyed me too, but generally I think the house is quite original, haven't seen anything like this on any of the dollhouse producers websites.